Spearmint (near site of underground water-tank) picked from amongst the nettles. Friday’s dig was another successful day. And the weather was really good as well! 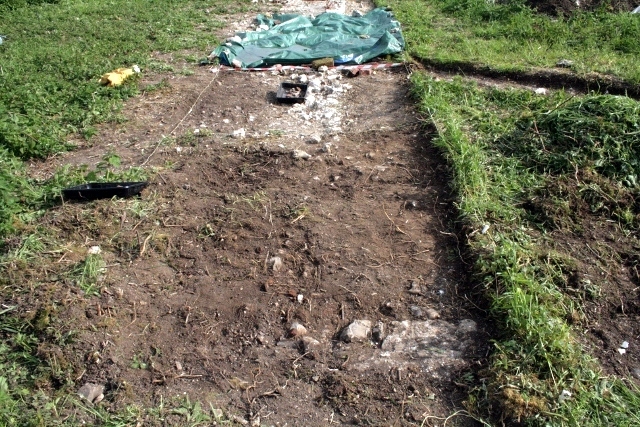 Trench 1 has now been extended right up to the north boundary wall of the property. Enough of this north wall has now been exposed to estimate its course, only a couple of feet south of my earlier estimate based on a 1921 plan. Peggy showing probable location of near corner of barn. This photograph was taken standing on the site of the front garden gate looking west along the north boundary wall, past the site of the outside toilet which was located in the corner of the garden wall (just out of the photo), towards the entrance to the farmyard, and the barn with a large water-tank in its eastern end, the corner of which is being marked by Peggy (my mother, who was born in Newmarket Farm in 1942). 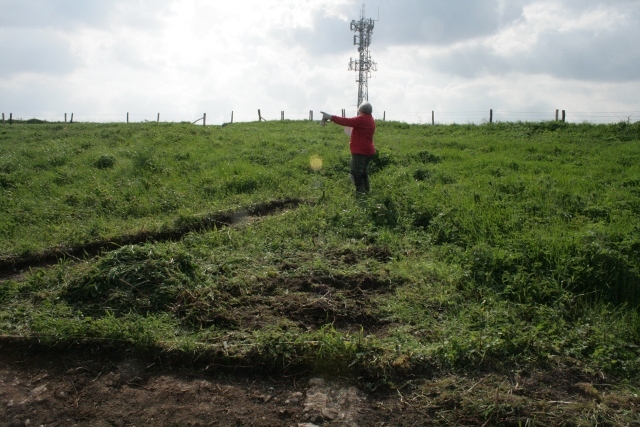 This section of the north boundary wall is to be explored with a new 1 metre wide trench (trench 3). It will join with trench 2 (which runs diagonally in the above photo) following the course of the water pipe towards the north-east corner of the barn. I hope shortly that at the meeting of these two trenches, careful excavation will enable the purpose of this pipe to be understood. Did it stop at the barn (an overflow for a rain-water tank? ), or continue on towards a reservoir planned to be built by Oscar Selbach in the early 1920’s on top of Newmarket Hill, to provide water for a proposed housing estate on the other side of the hill? 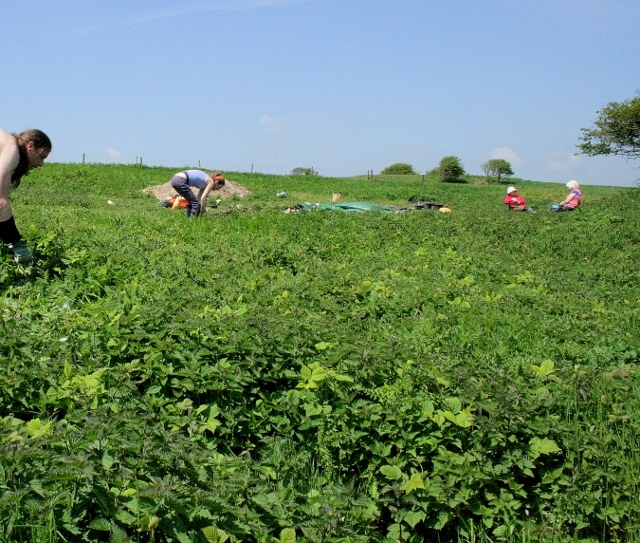 Photo taken from the S end of the former garden of new growth of nettles being cut, while diggers take a tea break. I also managed to arrange for two friends to cut down some of the nettles on site. They did a great job – and didn’t mind much about getting stung – for it is supposed to be good for you! Access to the dig site is now very much easier. Sometime in the next few weeks Natural England hopes to be able to follow this up. The dig is every much as exciting as I hoped, and though finds in the vicinity of the farmyard have been limited, this has been more than made up for by the features. With assistance from Brighton & Hove Archaeological Society we hope soon to be back inside the house again, with a better chance of both features and finds!